After deciding on the name, “Impulse Response”, for my consultancy company, the next step was to create a suitable logo for it. As I’ve explained before, impulse response is a basic concept from signal and image processing. If you have a linear time-invariant (LTI) system, the impulse response of that system tells you everything you need to know. For the logo, I wanted to use an impulse and a response to that impulse. Also, since I wanted to have a vector based version of the logo, I decided to generate it with Python. 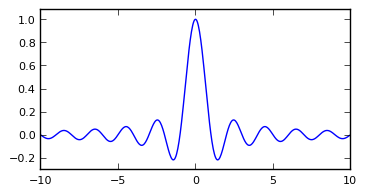 I used NumPy and SciPy to generated the impulse response, and matplotlib to generate the actual image. The impulse was easy, I just took a single one-value and used the look of a standard stem plot. Since the word Impulse happens to start with an I, I could then replace that I with this plot. You can create exactly this image with the Python script below. # Change limits and remove axis. I played around quite some bit with the response part, since there are almost endless possibilities. In the end, I decided that a “wiggle” behind the word response looked best. Of course, this wiggle had to have some actual meaning in signal processing terms. After trying several possibilities again, I went with a windowed bandwidth-limited impulse. That is quite a mouthful, but I'll try to explain what it means. and shown in the graph below. This looked like a usable wiggle, although it extends from −∞ to +∞, which is not what I wanted. However, there is a nice signal processing inspired solution for this, which is to window this function. A window function is a function that is zero outside of some interval, so that you can multiply another function with it to confine it to that interval. A cool option to use in this case is a sinc window (often called a Lanczos window), which is simply the stretched central part of a sinc function. 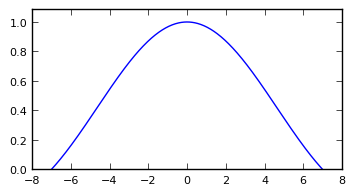 When configured to use the interval [-7, 7], this produces the following result. I could now simply have multiplied the sinc function with the Lanczos window and show you the result as the wiggle from the logo. However, that’s not how I really did it. In practice, I implemented a Lanczos interpolation routine, which allowed me to try all sorts of inputs. In the end, I decided to use a simple impulse anyway, and interpolated that using Lanczos interpolation. This resulted in the image below, which I used for the final logo. As before, a Python script that creates exactly this image follows. x: Signal to be interpolated. t: Location of interpolated sample.